Magento is one of the best front-end e-commerce platforms out there. But it lacks warehouse management skills. That's why it's partnered with Peoplevox; it knows that our WMS is the back-end solution that the e-commerce industry needs. Peoplevox's WMS deals with real-time inventory figures, meaning that the stock figures you see will always reflect the inventory that's actually in your warehouse. No more overselling, no more human error, no more costly mistakes. Peoplevox’s solution improves the way your warehouse works. It increases efficiencies, guarantees accurate inventories and speeds up all fulfilment operations through the intelligent management of all processes, from goods-in through to despatch. Your e-commerce platform should be solid and dependable, but not rigid. Peoplevox's flexible and configurable solution allows Magento to do its job by looking after your warehouse the way you know it needs to be run; we program it to meet your business' unique needs. While being excellent at what it does, Magento can run into problems when it's not used in conjunction with an effective Warehouse Management System. 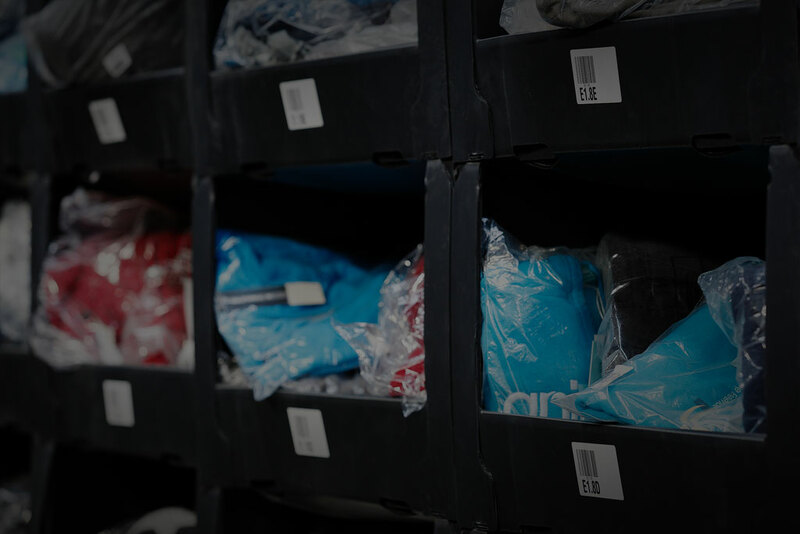 Without real-time inventory management, it can be easy to accidentally oversell products, lose track of which products are reserved and which are available stock, or experience other delays that cause late shipments. Printing out paper, sorting orders and finding products in the warehouse can be time consuming, as can organising the physical space. Plus, there’s no simple mechanism for monitoring and understanding the performance of your fulfilment team. Peoplevox's WMS solves all of those problems. It has a real-time inventory. It eliminates overselling. It keeps track of all items within your warehouse. It's accurate, accountable and will save your ground staff a lot of time. When you see it in action, don't be fooled by how simple it is to use; it delivers really powerful results across all fulfilment processes. Read how it helped to improve Fotter's Magento store here. How does the Magento integration work? Peoplevox's WMS can be easily integrated with Magento or Magento 2, with zero downtime. The system is configured to the needs of different markets and no development or installation is required on the Magento back-end. To work, all it needs is API access. This means that your developers won't be interrupted from performing their ordinary jobs. The integration allows Magento to share product and order information with the Peoplevox system, and Peoplevox WMS to share inventory and despatch information with Magento. 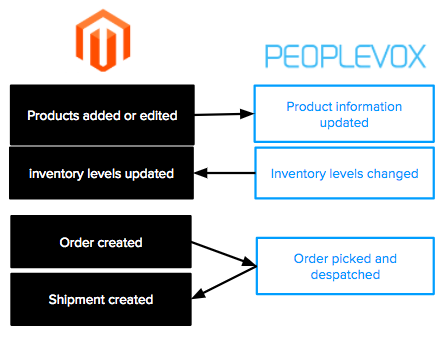 The exact points where Magento and Peoplevox communicate with each other are detailed in this flow chart. When all of these areas are synchronised, you will be in a really good position to scale without issue. Rigid inventories lead to some messy problems. We go over 5 of the main ones in this e-book, and explain what needs to happen to guarantee improvements.